Estyn are agents for Her Majesty's Chief Inspector for Education and Training in Wales. Estyn hold inspections of nursery and primary schools. Cwmaber Infants School was last inspected in June 2017. No judgement made by the Estyn inspectors came out with less than a good rating with wellbeing, leadership and care, support and guidance found to be excellent. 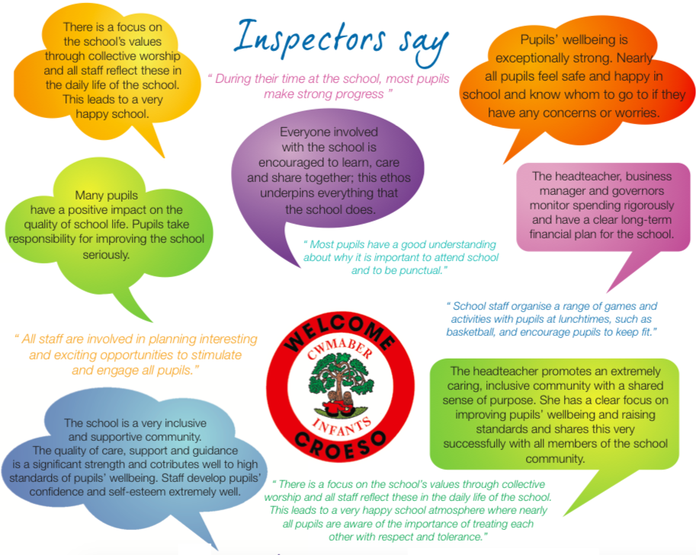 During the Inspection Estyn invited the school to prepare a written case study, describing the excellent practice identified during the inspection. A full copy of the 2017 inspection report along with the Estyn Excellent Practice Report can be downloaded below.